When it comes to complete, integrated surfacing systems, Optek systems stand alone. Because Optek manufactures every major component, customers can be assured that there are no weak links — mechanically or operationally. 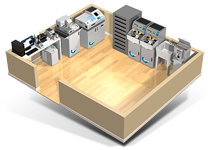 Each component is built to the same exacting standards of quality and accuracy, and every station or “cell” is specifically designed to work with the next to form a single, fluid process. What’s more, with an Optek system, you have only one place to turn for answers and support. Optek systems are about giving you control. Optek's commitment to cutting-edge research and development and pioneering technologies gives lab mangers and shop owners the tools to precisely control manufacturing processes — from ensuring the highest Rx quality to ensuring the lowest possible maintenance and downtime. With the world’s first microprocessor-controlled finer/polisher, the Criterion MAX, and the world’s first fully computerized surfacing system, the Oasis MAX, labs now have an unprecedented opportunity to limit exposure to human error. Since Optek equipment is designed to be as rugged and low maintenance as possible, chances are you won’t need Optek International's support staff often. But when you do, you will find us knowledgeable, courteous, and responsive. 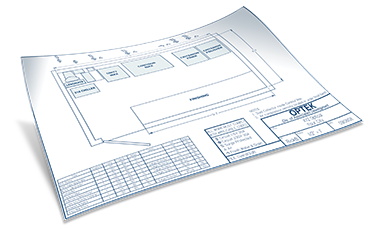 Simply give us a blueprint or sketch of your facility and we’ll draft a customized lab layout, showing the optimal floor plan, workflow, and utility service requirements!